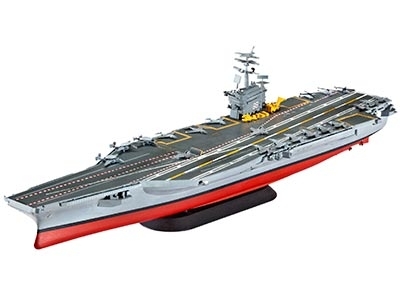 The nuclear powered USS Nimitz has been in service with the US Navy since 1975. Together with nine other aircraft carriers in this class, the Nimitz is one of the largest warships ever built. In addition to 5,680 soldiers there are about 85 military machines aboard this 333m long "supercarrier". The extensive radar and sensor equipment and an automated self-defence system provide surveillance and protection up to a distance of 230 sea miles. Thanks to her nuclear propulsion the carrier can move quickly over long distances and operate for months in the theatre of operations. She is permanently accompanied by a "carrier strike group" comprising, in addition to a supply ship, from three to five destroyers, one frigate and two submarines. The planned service life is 50 years.